"Have a ton of bluefish and don't know what to do with it? Give this a try! Bluefish has a reputation for being a very strong fish. This super citrus marinade gives this grilled fish a bright and delicious flavor. I just made some (which I caught and froze) and it came out superb." Place the fish fillets into a large bowl. Pour in the orange juice, lime juice, lemon juice, olive oil and white wine. Season with salt, pepper and seafood rub. Stir to blend and coat fish. Leave the squeezed lemon and lime halves in the bowl too. Marinate for at least 30 minutes. Preheat a grill for high heat. When the grill is hot, oil the grate. 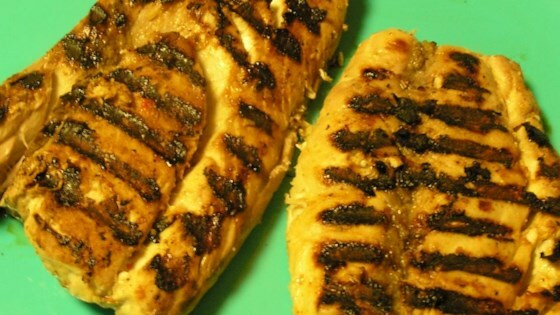 Place fish fillets on the grill, and discard the marinade. Cook for 4 minutes on each side, or until fish flakes with a fork. Transfer to a serving platter, and remove the dark blue part of the fish before serving. This recipe was fantastic. It gave the fish a sweet citrus flavor instead of the overbearing fishiness that is usually associated with bluefish.